When it comes to enhanced productivity for workgroups, the Canon iR-2025i & iR-2030i Models have no equal. These devices combine the smart multifunction capabilities that your business needs today while growing with you into the future through expandable functionality. Producing up to 1200 X 1200 dpi out at speeds of up to 25 and 30 pages per minute, respectively, these powerful systems deliver the benefits of digital copying, network printing, color scanning and optional fax features. With the Canon iR-2025i & iR-2030i copiers, the ability to work smarter is well within your reach. Sacrificing productivity for a compact design is unnecessary with the Canon iR-2025i & iR-2030i Digital Copiers. These systems are powered by Canon's imageCHIP architecture and offer you a choice of paper handling and finishing options to best suit your needs. Whether a beginner or an advanced user, these Canon iR-2025i & iR-2030i Digital Copiers are so easy to use and include electronic documentation to help facilitate operation. 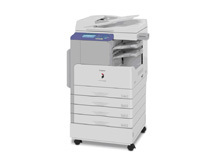 The Canon iR-2025i & iR-2030i models have a small footprint, so you can conserve valuable office space. Built up Canon's imageCHIP (Concurrent Hyper Intelligent Platform)Lite architecture, the Canon iR-2025i & iR-2030i models have been designed with fast multifunction processing and full concurrency. The architecture includes a powerful processor and 256MB of RAM to provide the resources needed to simultaneously handle the workflows of multiple users while maintaining the rated speed. The Canon iR- 2025i & iR-2030i Digital Copiers use Canon's RAPID Fusing System, which combines a durable film medium and a ceramic heater to quickly fuse toner to paper. 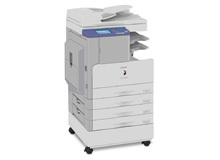 The Canon iR-2025i & iR-2030i models come standard with paper capacities of 500 and 250 sheets, respectively, and an 80-sheet stack bypass tray. For greater capacity, additional cassette options can be added for a five-way feeding system of up to 1,080 sheets. Media sizes of up to 11"x17" can be handled in all paper trays. A 250-sheet internal output tray is standard on both models and provides collating, grouping, and rotating capabilities. Withe the Canon iR-2025i & iR-2030i Digital Copiers you can change the way you communicate with the flexibility provided by the Standard Color Send technology. Distribute black-and-white and color documents in popular PDF,TIFF, or JPEG file formats in one time-saving step. Send them to network destinations such as individual or group e-mail addresses, file folders on the network, or an I-fax over the Internet. And with Canon's innovative PDF High Compression Mode to minimize file sizes while maintaining image quality, you don't need to worry about full-color documents clogging your network. Quickly and easily create electronic versions of your original documents with the standard 50-sheet Duplexing Automatic Document Feeder on the Canon iR-2025i & iR-2030i models. With standard USB 2.0 and 10/100Base-TX Ethernet interfaces, the iR-2025i & iR-2030i systems are easy-to-use network printers. Accessed through consistent and intuitively designed print drivers, each device can produce high-quality output at up to 1200x1200 dpi with the standard print controller. General office environments that print Microsoft Office documents will benefit from Canon's proprietary UFR II LT technology, which is optimized to facilitate high-speed printing by utilizing the user's desktop computer for data processing. Canon's Remote UI (User Interface) utility provides the ability to access the Canon iR-2025i & iR-2030i devices through a Web browser from any computer on the network. From the utility, users can check the status of the device, track the progress of current jobs, monitor paper and toner levels, and administer the Address Book. Regardless of your experience level, the functions of the Canon iR-2025i & iR-2030i models are highly intuitive. An easy Operation Guide provides step-by-step instructions on how to operate the device's main functions. Documentation is CD-based and features search tools to find answers quickly and easily.